BOWLS BC » OLBC Celebrates Canada’s 150th…. parade for the very first time. After weeks of planning and preparation, it all came together in grand style when the club’s float won first place overall. 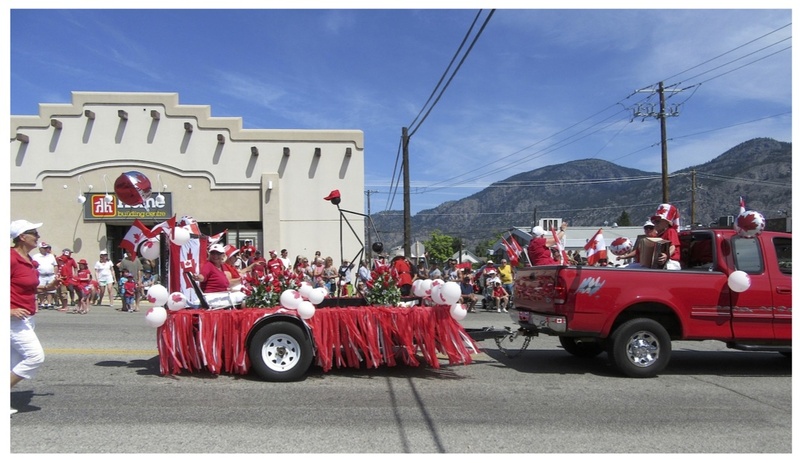 As the float moved along Main Street in downtown Osoyoos, the first-place ribbon was proudly displayed to the huge crowd that lined the street. Congratulations to Brian, Patsy, Claudia, Tony, Nancy, Jean, Judi, Robi and Pauline who all took part in decorating the float and then walked or rode in the parade. Well done you! Later in the day, the celebration moved to the green where the club hosted a BBQ for members, family and friends. Bowler Burgers and Jack Dogs were enjoyed by all. Everyone was in the mood for celebrating and when the birthday cake was cut, heartily sang Happy Birthday! to all of Canada. After eating cake and ice cream desserts, all bowled to the rhythm of music from the bandshell and laughter on the green. Oh, what a day! Oh, what a celebration! Only in Canada, eh!